This vibrating baby toy puts the "aww" in "chainsaw." Little Lumberjacks and Jills will be delighted by this plush buzz saw toy. Adults may chuckle at the sight of your baby armed with his or her first power tool, but the built-in vibrating motor and crinkly "blade" keeps young brains active and engaged. It's also a soothing sensation, so your little sprout might just end up sawing logs when playtime is done. Made in China. 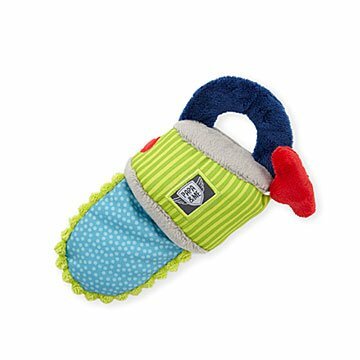 Big enough to not get lost, small enough for a 4 month old to squeeze and grasp easily. His brothers just love playing with him and it keeps them all busy for a few. This was a great gift for my infant nephew, whose father had a tree cutting business. I just wish it was a little larger! My friend's baby's new favorite toy! Fun, tactile entertainment for a cute baby! I have this to a nephew, who absolutely loves it!